Nintendo's grand, animal-filled sandbox franchise makes its way to Wii gamers in this updated remake of one of the GameCube's most popular titles. 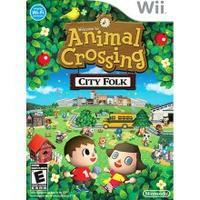 Animal Crossing: City Folk retains all of the relaxed rural atmosphere of the original and adds a metropolitan twist, letting players take a bus to the new urban city area, where they can to catch a show at the theatre or go shopping at fancy boutiques. As always, the series unfolds in real time, so gamers can go trick-or-treating at Halloween, build a snowman in the winter, and watch fireworks in the hot summer months. Relationship building remains a crucial part of the Animal Crossing experience in City Folk, as players can befriend their neighbors by exchanging letters, gifts, and favors. As in the GameCube version, up to four gamers can live and work in the same city, though not at the same time. However, thanks to Nintendo's Wi-Fi connection, gamers on four separate systems can inhabit the same town simultaneously. City Folk also stands as the first game to make use of the Wii Speak microphone, allowing gamers from around the world talk to one another.